Addiction counselors help patients overcome dependence on drugs, alcohol, and destructive behaviors like gambling. Counselors intervene when patients are often at their lowest points in their struggles with addiction. A certified drug and alcohol counselor may also work with the families of addicts to assist the healing process. These professionals may work in outpatient facilities, inpatient rehabilitation centers, halfway houses, or hospitals. Often, a certified addiction counselor has a personal passion for the work; some have overcome substance abuse themselves, or have witnessed a loved one's struggle. People may also be drawn to this specialty because they can make a real difference at work every day. UNC Charlotte’s Master of Arts in Addiction Counseling prepares the student to work effectively in various treatment settings and with a variety of addictive behaviors. Students will learn how to assess the needs of the client, create treatment plans, help the client set goals and refer them to critical resources. Through coursework, practicum, and internships, students will learn how to help clients identify unhelpful behaviors and teach them important coping skills. Students will learn how to employ a wide range of clinical skills and methods, including how to engage families in the recovery process. Over the past 10 years, 100% of our graduates have passed the licensure exam for addictions on the first attempt. Our graduates have been employed at the McLeod Treatment Center, Anuvia, the Charlotte Rescue Mission, SABER, Phoenix Counseling Center, to name a few. UNC Charlotte’s program is one of only five in the state that has been approved by the North Carolina Substance Abuse Practice Board (NCSAPPB), which is the credentialing body for addiction counselors in the state of North Carolina. This gives students in our addictions program a fast track to licensure as a Licensed Clinical Addiction Specialist (LCAS). Our program is a member of the International Certification and Reciprocity Consortium (IC&RC) which gives graduates very portable skills. Depending on the certification, students may be able to transfer certification to another state without retaking a course. Currently, thirty-eight states, Puerto Rico and D.C. are members of the Consortium. Our Addiction Counseling program has been recognized twice as the Outstanding National Program of the Year in addictions from the International Association of Addiction & Offender Counseling (IAAOC) in 2008 and again in 2011. 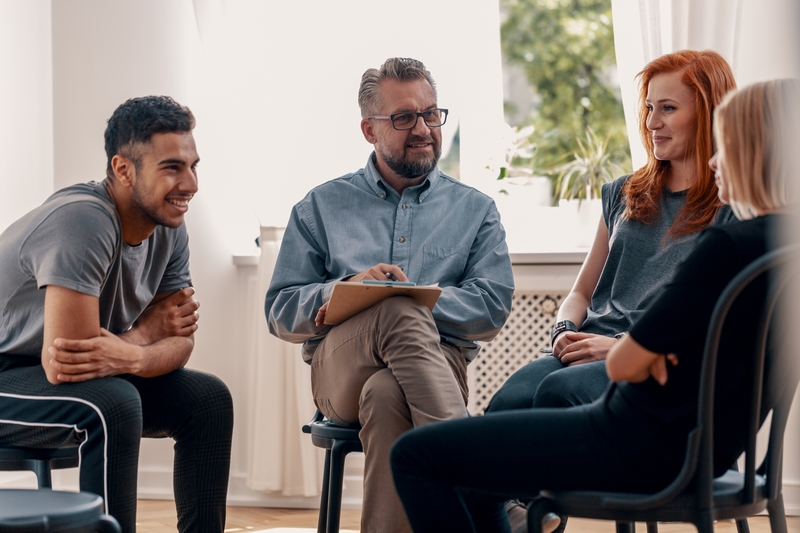 Our Master of Arts in Addiction Counseling is accredited by the Council for Accreditation of Counseling and Related Educational Programs (CACREP). CACREP Accreditation provides recognition that the content and quality of the program have been evaluated and meets standards set by the profession. Students in the Master of Arts in Addiction Counseling program complete 60 hours of graduate coursework and participate in three semesters of field experience. Besides the core initial counseling coursework, Theories of Chemical Dependence, Assessment & Diagnosis of Chemical Dependency, Chemical Dependency: Counseling Individuals, Families, & Groups, and Chemical Dependency: Treatment Planning & Relapse Prevention are courses specific to this concentration. In addition, through the three field experiences, students will obtain experience in a broad range of skill areas, including: individual counseling; group counseling; parent and/or family counseling; program development, implementation and evaluation; staff development and training; and appropriate administrative functions and processes relative to their clinical placement. The practicum experience consists of 150 hours of on-site work, during one semester, with 60 hours expected in direct contact with clients. The internship experience consists of 600 hours of on-site work, across two consecutive semesters, with 240 hours expected in direct contact with clients. The practicum and internship experiences bridge the gap between the skills acquired in the classroom and the world of professional practice. According to the Bureau of Labor Statistics, Employment of substance abuse, behavioral disorder, and mental health counselors is projected to grow 23% from 2016 to 2026, much faster than the average for all occupations. With about 115 people in the country dying from opioid overdose each day, the demand for these specialized counselors is rising significantly. Demand for substance abuse, behavioral disorder, and mental health counselors is also expected to increase as states seek treatment and counseling services for drug offenders rather than jail time. In addition, there will be a continued need for counselors to work with military veterans to provide appropriate mental health or substance abuse counseling care. Graduates may also decide to pursue our doctorate with a specialty in teaching in the addictions. Our courses offer practical assignments through which students may shadow an addiction counselor, visit treatment facilities and learn from practitioners who visit the classroom to share their experiences. Students complete an internship over two semesters spending 20 per week in a counseling setting where they are supervised by a Licensed Clinical Addictions Specialist who is a Certified Clinical Supervisor. Our students have been placed in a variety of sites to complete their clinical training such as the McLeod Center, Anuvia Prevention and Recovery Center, the SABER program and the Charlotte Rescue Mission. The Cato College of Education hosts the annual McLeod Institute on Addiction, a week-long training conference for professional practitioners and graduate students. Students earn three (3) hours of graduate credit by participating in the Institute. This professional workshop allows students to gain valuable insights from current practitioners and connect with professionals in the field. Our program annually receives scholarship money from the NC Governor’s Institute on Substance Abuse to support our students in obtaining their master’s degree in addiction. Students who qualify for this award also receive support toward obtaining the Licensed Clinical Addiction Counselor credential post-graduation. Learn from faculty who hold PhDs and are active, licensed practitioners in the counseling profession. They bring years of experience to provide students with practical and relevant instruction and mentoring. They also understand the importance of providing quality instruction in the classroom and professional guidance and supervision during the practicum and internship experience. Three of our faculty members won the National Addiction Educator of the Year Award from IAAOC. Our students also clearly benefit from faculty instruction. Two recent graduates won the North Carolina Addiction and Offender Counselor Award from the NC Counseling Association. Are you ready to make a difference in the lives of those in need? Do you have good communication skills, the ability to listen, patience, and a genuine interest in the well-being of others? Are you ready to help people discover a healthier life? The work of a substance abuse counselor is important and complex and requires a person with compassion, understanding and empathy. It is also a rewarding career that allows you to make a real difference in the world. Click here to learn more about the requirements for the Master of Arts in Addiction Counseling program, graduate student financial aid and the graduate application process. The certificate program admits practitioners and students who either hold or are currently enrolled in a CACREP-accredited graduate degree program. In addition to the general requirements for admission to a certificate program, applicants must provide official transcripts, three letters of recommendation from persons familiar with the applicant's personal and professional qualifications, and an essay describing the applicant's relevant experience and objectives in undertaking the certificate program in substance abuse counseling. Financial assistance is available on a limited basis for students enrolled in the Substance Abuse Certificate Program. Contact the Department of Counseling for information on scholarship application.